Grab your passport and prepare to be whisked away to Leonardo’s Milan. Arts & Architecture in Cinema (AAIC) and Fathom events present a remarkable look into the genius of Milan. Experience the works and legacy of Leonardo da Vinci like never before–that is, unless you have had the privilege of traveling to Leonardo’s Milan, Florence, Rome, and France. Go beyond the Mona Lisa and The Last Supper and witness a rare 4K glimpse into the life and times of the world’s most famous Renaissance man. 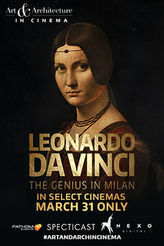 Combining interviews with Da Vinci scholars along with actors portraying Leonardo’s subjects, pupils, and contemporaries, this film will open your eyes to the Leonardo that you never knew. Although there clearly lacks a story in the traditional or cinematic narrative sense, there IS definitely a story here. Like with art itself, the story is left up to interpretation by the viewer. Perhaps your story interpretation will be one of inspiration or maybe a new clairvoyance into yours or someone else’s life. Either way, there is something for any art or architecture lover. The first element of the documentary film that I noticed was simply the fact that the entire film is in Italian; albeit apropos, it definitely served as a minor distraction from my ability to concentrate on the stunning visuals in the documentary. Never having traveled abroad before, I was very excited to feel this close to such renown works as The Mona Lisa, The Last Supper, and more. The beautiful imagery outshines the highest resolution coffee table art books. That is largely in part due to the giant screen and 4K cameras that were used in this production. Now, I am not accustomed to watching foreign films, so it is entirely possible that what I found to be a distraction is not as distracting for those who watch foreign films. However, it would have been greatly beneficial for the distribution company to have dubbed the the film in English. Granted, it would have lost a degree of authenticity in the true Milan experience, but I would have probably learned a little more than I did. That being said, I still found the documentary film to be full of fascinating information and insight into Leonardo. One of the predominant themes in the film was the reoccurring message (sometimes direct and other times indirect) that Leonardo did not consider himself a painter; paining is what he did to “pay the bills,” so to speak. Not unlike aspiring visual and performing artists of today, it appears that Leonardo had a day job in order to support his love of dreaming, designing, science, research, and architecture. Yes, even Leonardo was at times sloppy, lazy, and lacked interest in painting. Some of his most famous sketches and paintings are unfinished because he decided to move on. He loved science and engineering more than anything else; and although his flying machine and other inventions have been found to be impossible or impractical, it doesn’t take away from his genius. While we may have referred to Leonardo (as well as many of his contemporaries in the arts and sciences) as a man of the future, the scholars in the film point out that he was a man of the now. However, due to his nearly unparalleled level of curiosity, he indirectly inspired countless artists and scientists to pursue what they love and find interesting. A man of the present, future, and a man of mystery. Leonardo loved mysteries, enigmas, and puzzles. And no, I am not referring to his code. Just like he was intrigued and mesmerized by natural mysteries or breaking barriers of gravity or even the celestial realm, he left mysteries behind. True, it is due to his reputation as a man of mystery that author Dan Brown developed his Angels and Demons and Da Vinci Code. But it goes way beyond the creative fictitious codes Brown attributed to the Renaissance man. Leonardo wanted to make sure that no one could copy his work. In fact, he kept a very small staff of pupils around him in order to have control over his visions of paintings, frescos, architecture, and engineering. According to the scholars and his contemporaries in the documentary, Leonardo found the inspiration for his enigmas and mirror writing from nature itself. The inclusion of actors portraying historic individuals from Leonardo’s day was an brilliant element in the film. Speaking from a historic point of view but including information from today, the characters were able to help bridge the gap between the world of Leonardo and ours. It added a fantastic dimension to the documentary that greatly enhanced the experiential factor. Ordinarily, this is where I point out what may prompt you to see the film, but this documentary was a one-night event. That being the case, it is likely that you may have to wait for it to be released on Netflix, RedBox, or on BluRay. But, if you enjoy history, art, and architecture, I encourage you to remain on the lookout for this title to appear in your queue.